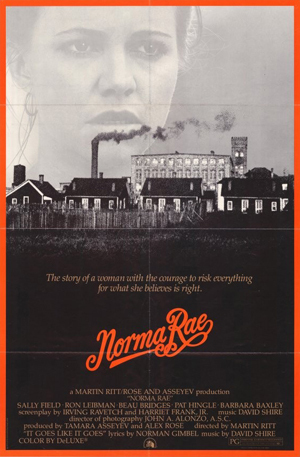 Set in the industrial South and based on a true story, Martin Ritt's 'Norma Rae' is a moving portrait of a woman's fight to improve both her own life and the deplorable conditions that exist in the mill where she works. 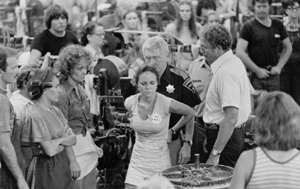 Norma Rae (Sally Field) has worked at the textile mill for years, but when a union organizer from New York comes to town, Norma takes on the hostility of the mill's management and the apathy of her coworkers to try to unionize the mill. Field plays Norma Rae as a passionate woman who realizes her own potential and her need to rebel against the status quo. She is also infuriated by the conditions at the mill. When Norma, uneducated and poor, finally expresses her disgust with life at the mill, it is an electrifying moment, and Field radiates this energy for the rest of the film, providing an emotional core and drive that gives the picture its power. 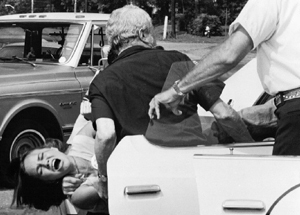 Best Actress... Sally Field - 1979 L.A. Film Critics Assoc. Copyright © 2008- Alamance Community College and Crystal Lee Sutton.